10 km East of Münster, Northrhein-Westphalia, (To find the chapel, head towards the bell tower of St. Clemens church next to the chapel of the Black Madonna.) around 1370, 150 cm, poplar wood, polychrome under layers of soot. She has a sacred tree that is still alive. Other Black Madonnas bridged the gap between sacred trees and Christian altars, between heaven and earth.Altötting, Antipolo, Bar-sur-Seine, Foggia, Halle, Neuerburg, Neukirchen-beim-Heiligen-Blut, Monte Civita, and Swieta Lipka are some examples, though half their trees are dead now. 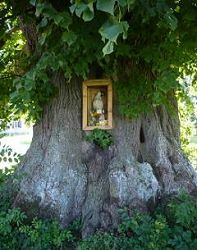 The trunk of Telgte's Marienlinde (Mary-Linden-Tree) is about 750 years old with younger branches springing from it. You will find it at the entrance to the town, coming from Münster, with a copy of the Sorrowful Mother beneath it. According to the legend she appeared in that tree and lived under it for many years. (The full tale is given below.) Her present 'chapel of grace' was erected for her in 1654. The chapel is octagonal as is the one of the Black Madonna of Altötting, who also has her roots in a sacred linden tree. Several stories tie the Sorrowful One to her Marienlinde even though she now resides in her chapel in the center of town: One claims that she was carved from its wood even though she is actually made of poplar wood. Perhaps a previous incarnation of her was made from the sacred linden wood? Another story tells of pilgrims taking home leaves from her sacred tree as a souvenir and each leaf later revealing an image of the Madonna formed by the veins of the tree. Yet another tale talks about the younger linden trees in front of her chapel. One time those trees supposedly all folded their branches as if they were hands folded in prayer in thanksgiving for a miracle the Sorrowful Mother had just performed. Being intimately connected with nature, this Sorrowful Mother was also used to bless the fields. She would be carried in annual 'field processions' (Flurprozessionen) through the land in order to invoke good weather and healthy crops. That's what the handles on her base were for. One may wonder: as the Church appropriated Pagan objects of worship like trees, groves, springs, and rocks, did it value their sacredness or was it merely a ploy so that they could be controlled and gradually erased from people's consciousness? I think both. "The Church" is not a monolith. There were clergymen who had no respect for anything Pagan, natural, or feminine. But there were also mystics who saw the divine in everything around them, and there were (and are) many who were both, privately mystical, but publicly power brokers and politicians. Also, the Church was in no hurry to do away with sacred springs, trees, and rocks. It didn't worry about them being "un-Christian" until the 16th century Reformation and the following "Enlightenment" or "Age of Reason". In that era much of Catholic tradition, with its ancient, pre-Christian roots, became ridiculed as superstition and tossed out. Veneration of the earth and special places on it, was one of those proverbial babies that were thrown out with the bathwater. The Virgin of Telgte is one of the oldest Madonnas of the type called 'pieta' (i.e. Mary holds the dead body of her crucified son on her lap.) Is it a coincident that one of the Black Madonnas with the clearest connection to Mother Earth is a Sorrowful Mother? Certainly the earth must be sorrowful at our treatment of her. After the 30 Years War, in 1654, when she received her 'chapel of grace,' Catholic authorities encouraged and organized pilgrimages along designated paths with stations to commemorate and contemplate the sorrows and joys of the Mother of God. They continue to this day. Particularly popular is the one held on the second Sunday after the feast of Saints Peter and Paul when thousands of devotees walk the 47 km from Osnabrück, as they have been doing since 1852. A less somber pilgrimage takes place every year on Mayday when pilgrims arrive by historic horse-drawn carriages. The most beautiful carriage wins a prize. As with many statues of Mary, she was crowned many times by her devotees, but the official, canonical coronation by a papal delegate took place centuries later, in this case in 1904. The crown is still used on special occasions. Once upon a time, on a winter evening, a young peasant boy from Telgte was returning in his ox cart from Münster where he had dropped off his tithe in corn. As he approached Telgte, the oxen, already smelling the warm stable, began to run faster. But when they were about to pass the big linden tree at the entrance of the town, they suddenly stopped and would not be persuaded to continue home. Yelling at the beasts, the boy got off the cart and looked around. Behold, the linden tree had been cut open as if hit by lightning and in the opening stood the wonderful statue of Mary holding the dead body of Jesus on her lap! Mother and Son shone in a bright white light that reflected off the icicles on the tree and the snow all around. As the peasant knelt in the snow and prayed, he saw thick clusters of blood hanging on the hands and feet of the Savior and the wound on his side wide open. The boy also heard a faint song coming across the fields as a flock of blackbirds approached and settled in the linden tree. When their sweet concert ended he heard a voice from on high that was far more delightful than any birdsong. It said: "Bring my image to the people." The boy prayed on, but finally he arose in order to fulfill the command he had received. With trembling hands he took off his hat in respect, picked up the image in one arm and pulled on the oxen's reins with the other. He was going to bring the statue to the priest in Telgte, but the animals still would not move. Perplexed he let go of the reins. [Good idea!] Immediately the oxen began to walk, guided by an invisible hand. They turned around and took a way that led away from Telgte. Hat off and shining image in his arms, the peasant followed behind. On and on they went, but neither animals nor man got tired as the snow below the wheals creaked: "Christ… Christ…." Thus they walked and prayed all night. When dawn broke they arrived at the isolated nunnery Rosenthal near Osnabrück and that's where the oxen stopped. Shyly the boy told the nuns all that had happened. They were overjoyed with the great honor the Mother of God was bestowing upon them and with a solemn procession they carried the statue into their church. There stood the Sorrowful Mother in all her touching pain. As the nuns began to sing the psalms of the morning prayers the image began to shine brightly again. It was as if Mother and Son were formed out of pure light. Awestruck the nuns fell silent and contemplated the amazing figure. Its light was so bright that they had to close their eyes again and again. After a long and ardent time of prayer the sisters rose to leave the church, but when they took their eyes of the Sorrowful Mother they couldn't see a thing. In fear they realized that they had been struck blind by that divine glow. After some confusion the abbess said sternly: "I too cannot see anything since I have beheld Her and Her Son. Be still, go back to your cells and come back here for the evening prayers. We will wait and see what plans God has for us." While the nuns felt their way back to their cells the abbess knelt before the image of grace. There she stayed and prayed all day. She called upon Heaven: "Suffering Savior, Holy Mother, we thank you that you came to our convent in all your heavenly beauty. We thank you that we were allowed to see your beauty and the radiance of your transfiguration. We saw you, Sorrowful Mother, and the transfigured wounds of your son that burned like rubies. But this heavenly radiance is too magnificent for us, we cannot bear it. It burnt our poor eyes. Gracious God, we ask you, return our eyesight to us. Holy Sorrowful Mother, we ask you, take off your dress of radiance, if you want to stay with us, wrap yourself into a poor robe, otherwise our hearts will shy away from you." When the abbess heard the sisters coming back for the evening prayers, she went to her seat and began to sing the sacred chants by heart. When the solemn moment came at which all rose and sang the magnificat (Mary's song from the Bible), the blindness fell from everyone's eyes. When they looked at the image of grace they noticed that it had changed. It no longer radiated white and pure in heavenly light, instead Mother and Son had turned completely black - black and poor, because humans couldn't bear their heavenly effulgence. Soon many people began to stream to the nunnery with their sorrows and their wounds in order to be consoled by the wounded Christ and his sorrowful Mother. Now, at some distance from the convent there lay a village full of evil peasants who wanted nothing to do with religion and no one wanted anything to do with them. One morning a few of these people were coming home from a nightly poaching excursion when they noticed that an image of the Mother of God had appeared in the middle of their village. "What is this image doing here?! We've long since gotten rid of all such silly stuff!" Soon the whole village was gathered around, but nobody knew how the image had appeared. One boy yelled: "I know that statue. It stood in the convent in Rosenthal. The nuns must have secretly brought it here during the night, trying to convert us. But we will teach them a lesson! I'll take that thing back to them and make them happy!" he said with a sarcastic grin. Then he quickly hitched two horses to a cart, loaded it with garbage, and grabbed a filthy, old rag. Among great laughter from his villagers he threw the rag over Mary as a mock robe, but lo, when he placed her on the garbage, fear struck the peasants, because the moment the Mother of God had touched the garbage, it had turned into a pile of all kinds of the most wonderful white and blood red flowers. The rag too had been transformed; suddenly it was a precious cloth that adorned the Sorrowful One beautifully. The people all ran away as if chased by the devil. From a distance they finally dared to turn around and take another look. They saw how the horses were trotting towards the convent led by an invisible hand. When the Sorrowful Mother arrived back at the convent, the nuns were overjoyed, for they had looked and inquired for her everywhere. But they could not explain to themselves the mysterious disappearance and reappearance of their treasured possession. In any case, the abbess ordered that from now on there should always be a nun praying before Our Lady around the clock. After a few weeks it was the turn of an old sister to take a night shift before the sacred figure. Towards morning she couldn't keep her eyes open anymore and fell asleep. When she awoke the Sorrowful Mother was gone! Horrified the old lady got up. Then she noticed that the church door stood wide open. When she stepped outside she saw the tracks of a fine little woman's shoes in the sand path leading away from the church. Sensing a mystery, she followed the lead. It took her along a dirt path lined by bushes that carried strange, red berries. When she stopped to look at these berries that had ripened so early in the year she realized they were thick drops of blood. Then she understood! Now she would kneel reverently every time she came to another drop of blood and kiss the bloody leaves. After a while the tracks stopped. Looking around, the nun saw the sacred image with the Son's wounds still fresh and red with blood. Then she realized that she was right in the middle of that notorious village. Yet she didn't worry about a thing, but knelt before the Black Madonna. Suddenly she noticed that a child stood next to her crying. It told her that the statue had already shown up one time, a few weeks ago, and how the men had mistreated it. Now the old nun understood why the Heavenly Mother had wandered away from the convent twice. She wanted to remain here, in the middle of this infamous village. As fast as she could, the old sister went back to the nunnery and told the abbess everything that had happened. The abbess too realized the will of the Sorrowful One. Of course none of the religious wanted to say good-bye to their Mother and so they decided to move the whole nunnery to the place Mary had chosen. Amazingly enough, the notorious peasants allowed the nuns to do whatever they pleased and soon the new nunnery stood in the middle of the ill-reputed community. It came to be called Marienberg (Mary's mountain). That was the end of the power of evil over the hearts of its formerly so willing followers. The strong woman had come and crushed the head of the serpent. [Compare to Genesis 3:15] No sooner was the convent completed then the children began to show up at church. The peasants let them. Later the women came with their children, and after a year the men showed up. With great love the holy Mother drew all to herself and led them back to her Son. Decades later bad times afflicted the Church. Laity, priests, and religious alike lost the earnestness of their faith. No one cared for the commandments of God or Church. Unholy men sought holy offices, and worldly-minded, pleasure seeking women entered the convents in search, not of God, but of an easy life. The faithful old nuns at Marienberg had all passed away and the new "sisters" didn't care for the Black Madonna. More sorrowful than ever she stood alone in her deserted church. There was only one who still clung to her with faithful love: the old man who had found her in the linden tree when he was a boy. Unable to leave her side, he had entered the service of the nuns and worked for them his whole life. Every day he would visit his divine Mother several times and pray. One day the "nuns" held a big party. In those days only aristocratic women could be ordained as nuns and so the invited guests were noblemen from near and far. A great feast was served and many monastic rules broken. At the time when the religious formerly sang the evening prayers, the old faithful servant found himself alone in the church praying his rosary. Instead of Mary being greeted with a procession and the chant 'Hail holy Queen' all one heard was the noise of the debauchery in the festive hall nearby. The old man with his unsteady old voice tried to recite his prayers more loudly so that poor Mary didn't have to listen to that unholy noise, but his voice had lost its strength and all one could hear was a loud party song. The old man fell silent and fearfully looked at the holy Mother. Lo, she was crying! Two streams of bitter tears ran down her face, falling onto the black, wounded body of her divine Son. Now the old man too began to sob. He looked at her helplessly and with a trembling voice he brought forth: "How they sadden you, oh if only I could console you! If I still had strength in my arms, if I wasn't such an old geezer, I would carry you away from here. I'd take you somewhere where no sinful and uncaring people can hurt your feelings!" He fell silent. She continued to cry. Suddenly something came over him. He arose and called out to her: "You won't stay here! They won't continue to insult you! I am taking you away!" And as if he was a young man again, he took her into his arms and carried her out of the church. She was light like a feather. But where to? She had already chosen a place and she led him there by making herself light when he walked in the right direction, but heavy when he took the wrong path. All night they walked like that. She never stopped crying, but his heart was happy that he had the privilege once more to carry her through the night. When the morning star began to shimmer the morning wind blew in the leaves of the Mary-linden-tree of Telgte where the old man had arrived with his Madonna. Here finally her tears subsided and her mouth opened, letting out a silvery, radiant laugh, a laugh more brightly shining than the morning star ever will. That's how the old man knew that this was the place where she wanted to be venerated and that it was from this tree that she wanted to pass the grace and consolation of her Son on to the human race. She spent centuries under her sacred tree until in 1654 the prince and bishop Christoph Bernhard von Galen built her a chapel in town. *1: "ex terra virgine Adam, Christus ex virgine."